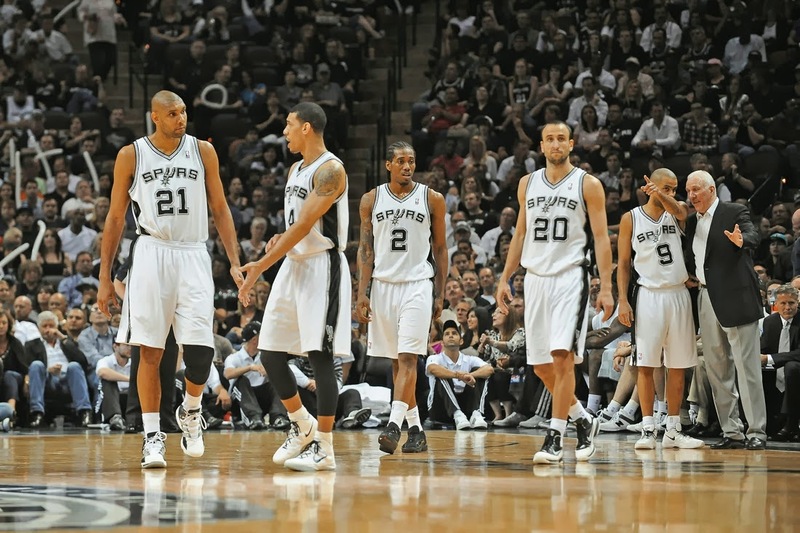 The San Antonio Spurs are incomparable. Even as someone who has hated—pretty much unfairly—the majority of the Tim Duncan era, this fact has become easy for me to admit. Sure, one could argue that the Boston Celtics of the 50’s and 60’s, with their eleven championships (including eight consecutive), sustained a greater run of dominance and success; but the league only had eight teams then. In theory that would have made each team more flush with talent, except, c’mon it’s just not the same league now as it was then—players were smoking in the locker room and analytics were the type of things that belonged to the Space Race. Since 1997, the Spurs have won four NBA titles. They have been to the Finals five times in total. They’ve made the Playoffs in seventeen straight seasons and reached the Conference Finals in eight of those seventeen years. That is a remarkable level of consistency and achievement in an era where the game demands so much more, not only athletically, but also mentally, strategically and organizationally. One could argue that the Spurs’ achievement is unmatched in any other field. In music, no one is their equal. The Stones still make millions of dollars and, whenever they tour, still sell out shows all over the world, but their true sustained period of excellence lasted from 1965-1978—and whether or not they were actually great in 1975-1978 is seriously up for debate. Beginning with her first Academy Award nomination in 1979, Meryl Streep has been nominated for an Oscar eighteen times (the most ever by a male or female) and won three. She is unquestionably the living standard for Acting. But, even Streep had a down period from 1990-1995. In sports, perhaps the closest comparison to what the Spurs have done over the past seventeen years (since drafting Tim Duncan) is what the Patriots have accomplished in the Brady and Belichick era. The Patriots have only missed the Playoffs twice since 2001, and one of those seasons Brady was knocked out for the year with injury. They’ve won three Super Bowls and played in five. They’ve reached the AFC Championship eight times in thirteen seasons. But, still, it’s football. There are only sixteen games and not 82. Plus, according to Mark Cuban, the NFL is going to implode in ten years, so who cares anyway? Far-fetched comparisons aside, what all this means is that once again the Spurs are doing remarkable things as the NBA Playoffs approach. While the league chatter focuses on the struggles of the Heat and the Pacers; the Thunder’s title chances; the drama of the Knicks; and the entertaining basketball being played out West by title contenders like the Rockets, Blazers, Clippers and Warriors; the Spurs are sitting with the best record in the NBA all without seemingly breaking a sweat. The Spurs have won fourteen games in a row. During this winning streak, their average margin of victory is 14.6 points per game. They’ve beaten six playoff teams including an absolute scorching of the Miami Heat, a standard beat down of the Portland Trailblazers and a ho-hum victory over the Golden State Warriors in Oakland without both Tim Duncan and Manu Ginobli in the lineup. They are seventh in points per game at 105.2. They are fifth in opponent points per game at 97.6. Their defensive rating is fourth in the league and their offensive rating is sixth. Their 25.1 assists per game is tops in the league as is their overall scoring margin difference of 7.6. These are numbers without true historical context and since I’m not an analytics guru and I don’t have the time to do a true study to show what all this means, I’ll give you the bottom line (sponsored by Stone Cold Steve Austin’s Steveweisers)—the Spurs are scary good and look like the favorites to win the 2014 NBA Title. The way they play basketball is dumbfounding—in an amazing way. Everyone on their team knows exactly what to do and they do it not only well, but also selflessly. The ball flies around the court. Tony Parker darts into the lane, under the backboard zips the ball to the top of the key to Danny Green, who throws it over to Boris Diaw who drops it to Duncan who hits a cutting Tony Parker who then makes a floater that defies logic. If Parker needs rest, they bring in Patty Mills, who might as well be taking method-acting classes on the side because he has channeled Parker’s essence at this point. The fact that Boris Diaw is even on the team and continues to play vital part in the Spurs’ success is dumbfounding. Diaw’s existence as a basketball player is in itself baffling. Diaw looks like he has not turned away from a reasonably priced prix fixe meal in six years and yet manages to excel and always give LeBron a hard time when the Spurs and Heat play each other. Within the San Antonio system, Diaw’s gifts for passing and spacing have been amplified. They’ve been amplified because he has been taught where to be, why to be there, and how to be effective from his place on the court. And in the middle of it all, amongst the breath-taking, twisting Tony Parker lay-ups and break down dribbles; the unorthodox Manu Ginobli gyrations and off balance baseline jumpers; the soaring, yet mechanical grace of a Kawhi Parker steal and fastbreak dunk; the games where Danny Green looks like the best shooter in the league; in the middle of it all is Tim Duncan. An ageless wonder who has haunted my dreams since the mid-90’s when he sauntered around the court, slack-jawed and dominant at Wake Forest, grinning while Randolph Childress danced after big-balled three pointers. After sixteen years in the league, Duncan looks the same as he did when he was a 21 year-old rookie. He’s still throwing up a double-double for the year (15 points and 10 rebounds per game) and providing a stability and control to his game that I will never forget. But I live in New York, and all I hear about is the Knicks hiring Phil Jackson’s as President of Basketball Operations. Amid that talk, there have been mentions of Phil’s Triangle Offense, his philosophies on basketball, his belief in having players live in the moment and make the best decision for the team. The thing is, though, in San Antonio, Greg Popovich has the Spurs doing just that; and he’s had them doing that for seventeen years. These days, the Spurs play a beautiful brand of basketball that is far different from the style they were playing ten years ago. However, the principles of knowing your role, trusting the management to put you in the best position to win and speaking your mind only when it comes from a place of team betterment are all in place. After being in the work world for seven years, I’ve come to see how important these qualities are, not just in basketball, but in life overall. That is why I have come to appreciate the Spurs. I’ll still usually root against them, but they are a magnificent beast. I don’t know if they’ll win the 2014 title. We may just be set up for a repeat of 2012 when they were a juggernaut eviscerating the field on their way to a championship—that is until the Thunder figured out how to beat them. Either way, after all these years, I’m thankful for the Spurs. They remind me of how good things can be when they’re done the right way. And I’m finally mature enough to appreciate how hard it is do that for one year, let alone seventeen.